We're not normally so lucky with weather here in Galicia, however, tonight we had a small window without rain or clouds for twenty minutes or so which just happened to coincide with the time of the wonderful conjunction of the crescent Moon with Venus passing behind it and Jupiter up to the top right. 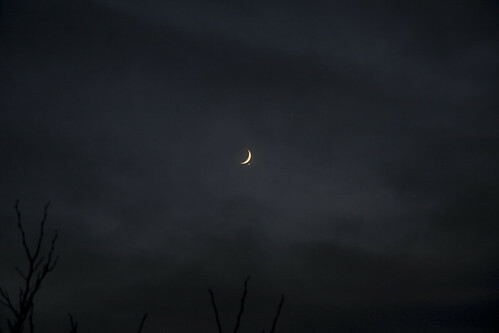 I went outside to take a look and could see the crescent moon, but no more. 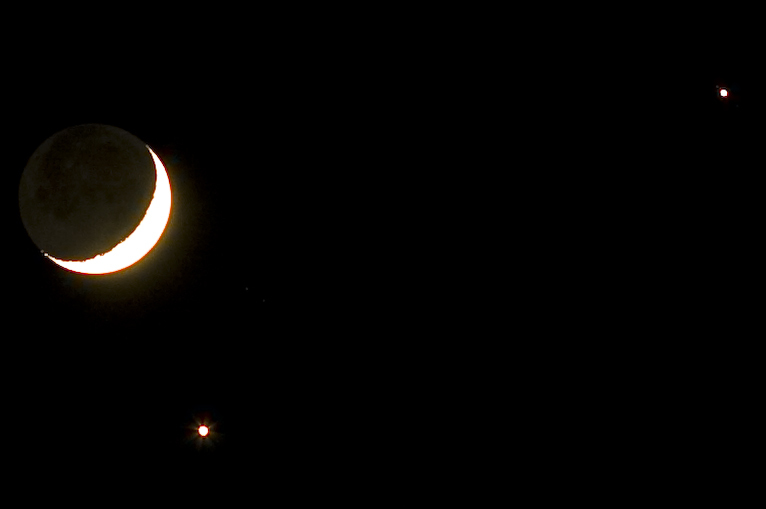 I stood watching it for a few moments, before I noticed a tiny point of light at the bottom right of the moon - Venus was beginning to poke its head from behind the sliver of the crescent moon. Sadly I had no tripod with me and so I had to balance the exposure with the ISO very carefully so as not to blur the photos or fill them with noise. I got a few which are no great works of art, but they are satisfying reminders of this rather wonderful astronomical spectacle. 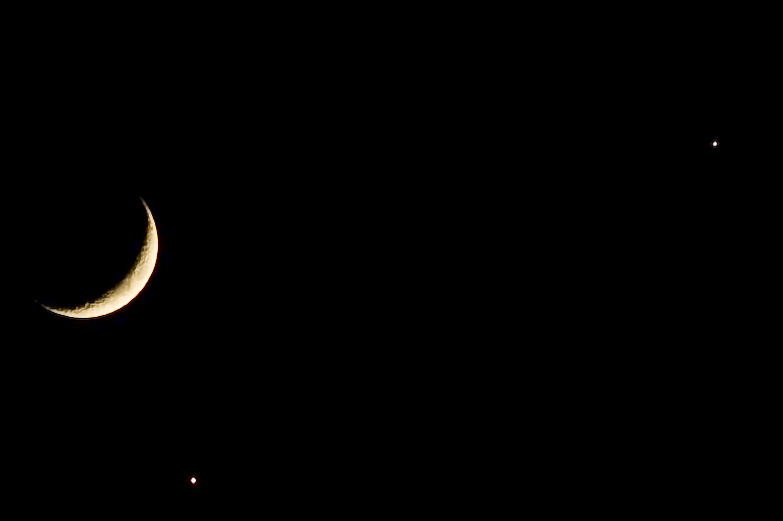 This first image was the first one I took, just as Venus started to show itself. The sky was still quite bright at this point and so Jupiter, to the top right is harder to see in this image, the sky was also filled with a mist, which stopped perfect visibility at this point. I hope some of you got to see it for real too. Will be looking out for more. Wow those are amazing. I am so fascinated by space. Great pictures thank you. i saw that yesterday and it was AMAZING!!! It was a clear night and it was beautiful! Just came across your post. 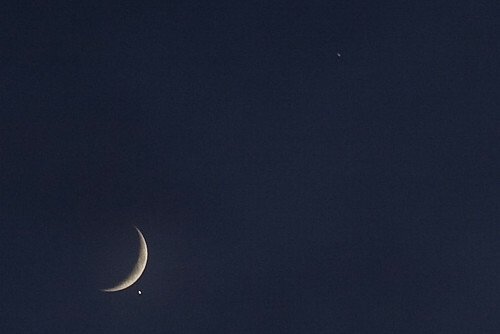 I saw this from southern England- as I left work that evening I could see the Moon and Jupiter, but Venus was behind the Moon. 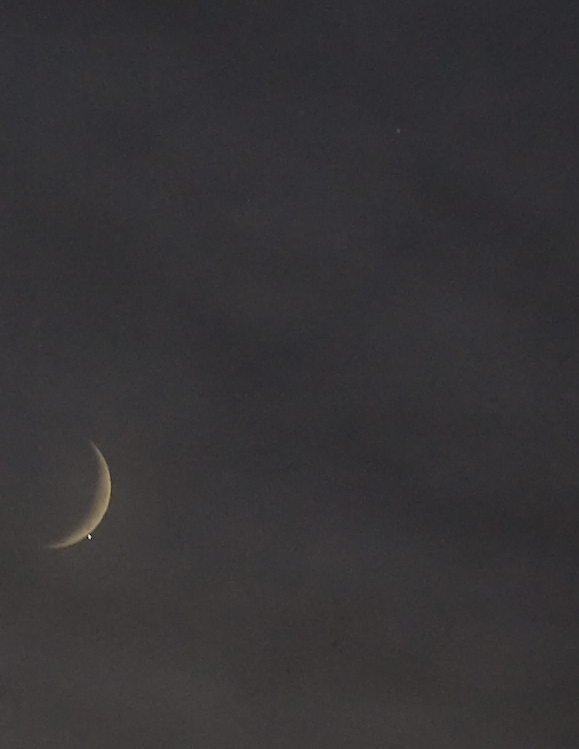 By the time I got home, about an hour later, Venus had reappeared from behind the Moon, but they were all lower. There is another Moon-Venus-Jupiter meeting late next May (I have written a bit about it http://grahampointer.blogspot.com/2010/11/four-planets-in-may-morning-sky.html) and then there is a better one in the spring of 2012, around March.